What do Robert Frost’s “Stopping by Woods on a Snowy Evening,” the Cecil B. DeMille classic early silent film The Ten Commandments, and Sigmund Freud’s The Ego and the Id all have in common? And for the next few decades, every New Year’s Day will unleash a similar flood of new materials that were created 95 years previously. That might not seem earth-shaking, but consider that for the last 20 years, the American public was robbed of free access to all sorts of creative content created in 1923 and following. Many texts were out of print, but the publishers who held copyright wouldn’t release it to anyone else to print. Many classic works of music and early silent film were inaccessible because nobody could (legally, at least) put their own recording or a copy on YouTube. Now? Have at it! Copyright didn’t use to be in place for so long, but in 1998, Congress passed a copyright extension act virtually without opposition, largely thanks to the lobbying of Hollywood and various other creative guilds. Smithsonian Magazine has a much better explanation than me. Thankfully, with the advent of the digital age, people are much more aware of the benefits of public domain, and it’s seen as fairly unlikely to be extended again. *Caveat: the original works were released in 1923 and those are public domain now. There are lots of other versions, reprints, editions, etc. that were published later — e.g. 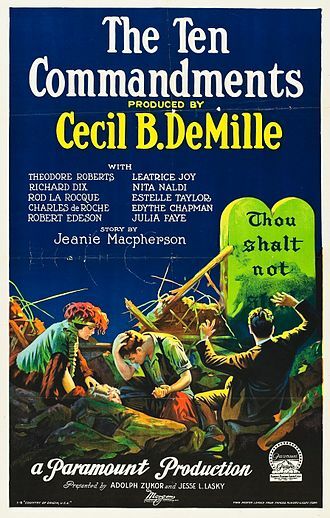 you might be more familiar with the “talking” Ten Commandments movie that was a 1956 re-make of the 1923 one, and the 1956 one is of course still under copyright. I’m not a copyright lawyer, but that’s my understanding :-).